Predatory mites are among the natural enemies considered for the control of damaging mites and some small insects. It is conceivable that effective control agents could be found in the Ascidae, Blattisociidae and Melicharidae, families whose members are rather similar morphologically. Together, these families comprise over 900 described species. It is estimated that slightly over half of these were described from soil, grasses, mosses or dead organic matter on the soil surface. The main emphasis in this review lies on a discussion about aspects most related to the possible use of members of these families as biological control agents, namely on their association with other organisms (including their capacity to disperse between parts of the preferred habitats), feeding habits and general biology. Most of the studied species of this group of families belong to Blattisocius Keegan and Lasioseius Berlese (both Blattisociidae) and Proctolaelaps Berlese (Melicharidae). Species of these and other genera have been shown to be generalists. 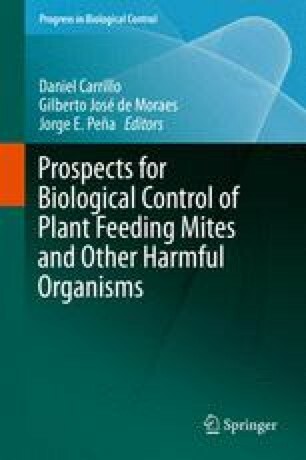 Despite the relatively little effort dedicated to evaluate the potential use of these mites as biological control agents, some have been reported as very promising. Prospective uses can be inferred mainly from studies involving pests living in humid habitats, as for example rice crop, as well as soil and storage pests. In order for these mites to be effectively used by growers, efforts should be concentrated on fieldwork to validate promising laboratory results. We are especially thankful to the following researchers who provided copies of the papers referred to in this publication: A.M. Afifi, C. G. Athanassiou, R.B. Halliday, F.M. Momen, P.S. Nielsen, J. Riudavets and R. Abo-Shnaf. We are also thankful to C.H.W. Flechtmann, for critically reviewing an earlier version of this document and providing us numerous suggestions.